Listing 1.1. HELLO.CPP, the Hello World program. Why C++ is the emerging standard in software development. The steps to develop a C++ program. How to enter, compile, and link your first working C++ program. The word program is used in two ways: to describe individual instructions, or source code, created by the programmer, and to describe an entire piece of executable software. This distinction can cause enormous confusion, so we will try to distinguish between the source code on one hand, and the executable on the other. New Term: A program can be defined as either a set of written instructions created by a programmer or an executable piece of software. Source code can be turned into an executable program in two ways: Interpreters translate the source code into computer instructions, and the computer acts on those instructions immediately. Alternatively, compilers translate source code into a program, which you can run at a later time. While interpreters are easier to work with, most serious programming is done with compilers because compiled code runs much faster. C++ is a compiled language. The problems programmers are asked to solve have been changing. Twenty years ago, programs were created to manage large amounts of raw data. The people writing the code and the people using the program were all computer professionals. Today, computers are in use by far more people, and most know very little about how computers and programs work. Computers are tools used by people who are more interested in solving their business problems than struggling with the computer. Ironically, in order to become easier to use for this new audience, programs have become far more sophisticated. Gone are the days when users typed in cryptic commands at esoteric prompts, only to see a stream of raw data. Today's programs use sophisticated "user-friendly interfaces," involving multiple windows, menus, dialog boxes, and the myriad of metaphors with which we've all become familiar. The programs written to support this new approach are far more complex than those written just ten years ago. As programming requirements have changed, both languages and the techniques used for writing programs have evolved. While the complete history is fascinating, this book will focus on the transformation from procedural programming to object-oriented programming. The property of being a self-contained unit is called encapsulation. With encapsulation, we can accomplish data hiding. Data hiding is the highly valued characteristic that an object can be used without the user knowing or caring how it works internally. Just as you can use a refrigerator without knowing how the compressor works, you can use a well-designed object without knowing about its internal data members. Similarly, when the engineer uses the resistor, she need not know anything about the internal state of the resistor. All the properties of the resistor are encapsulated in the resistor object; they are not spread out through the circuitry. It is not necessary to understand how the resistor works in order to use it effectively. Its data is hidden inside the resistor's casing. C++ supports the properties of encapsulation and data hiding through the creation of user-defined types, called classes. You'll see how to create classes on Day 6, "Basic Classes." Once created, a well-defined class acts as a fully encapsulated entity--it is used as a whole unit. The actual inner workings of the class should be hidden. Users of a well-defined class do not need to know how the class works; they just need to know how to use it. Inheritance and Reuse When the engineers at Acme Motors want to build a new car, they have two choices: They can start from scratch, or they can modify an existing model. Perhaps their Star model is nearly perfect, but they'd like to add a turbocharger and a six-speed transmission. The chief engineer would prefer not to start from the ground up, but rather to say, "Let's build another Star, but let's add these additional capabilities. We'll call the new model a Quasar." A Quasar is a kind of Star, but one with new features. C++ supports the idea of reuse through inheritance. A new type, which is an extension of an existing type, can be declared. This new subclass is said to derive from the existing type and is sometimes called a derived type. The Quasar is derived from the Star and thus inherits all its qualities, but can add to them as needed. Inheritance and its application in C++ are discussed on Day 12, "Inheritance," and Day 15, "Advanced Inheritance." Polymorphism The new Quasar might respond differently than a Star does when you press down on the accelerator. The Quasar might engage fuel injection and a turbocharger, while the Star would simply let gasoline into its carburetor. A user, however, does not have to know about these differences. He can just "floor it," and the right thing will happen, depending on which car he's driving. C++ supports the idea that different objects do "the right thing" through what is called function polymorphism and class polymorphism. Poly means many, and morph means form. Polymorphism refers to the same name taking many forms, and is discussed on Day 10, "Advanced Functions," and Day 13, "Polymorphism." As object-oriented analysis, design, and programming began to catch on, Bjarne Stroustrup took the most popular language for commercial software development, C, and extended it to provide the features needed to facilitate object-oriented programming. He created C++, and in less than a decade it has gone from being used by only a handful of developers at AT&T to being the programming language of choice for an estimated one million developers worldwide. It is expected that by the end of the decade, C++ will be the predominant language for commercial software development. While it is true that C++ is a superset of C, and that virtually any legal C program is a legal C++ program, the leap from C to C++ is very significant. C++ benefited from its relationship to C for many years, as C programmers could ease into their use of C++. To really get the full benefit of C++, however, many programmers found they had to unlearn much of what they knew and learn a whole new way of conceptualizing and solving programming problems. The Accredited Standards Committee, operating under the procedures of the American National Standards Institute (ANSI), is working to create an international standard for C++. The draft of this standard has been published, and a link is available at www.libertyassociates.com. The ANSI standard is an attempt to ensure that C++ is portable--that code you write for Microsoft's compiler will compile without errors, using a compiler from any other vendor. Further, because the code in this book is ANSI compliant, it should compile without errors on a Mac, a Windows box, or an Alpha. For most students of C++, the ANSI standard will be invisible. The standard has been stable for a while, and all the major manufacturers support the ANSI standard. We have endeavored to ensure that all the code in this edition of this book is ANSI compliant. The question inevitably arises: "Since C++ is a superset of C, should I learn C first?" Stroustrup and most other C++ programmers agree. Not only is it unnecessary to learn C first, it may be advantageous not to do so. This book attempts to meet the needs of people like you, who come to C++ without prior experience of C. In fact, this book assumes no programming experience of any kind. C++, perhaps more than other languages, demands that the programmer design the program before writing it. Trivial problems, such as the ones discussed in the first few chapters of this book, don't require much design. Complex problems, however, such as the ones professional programmers are challenged with every day, do require design, and the more thorough the design, the more likely it is that the program will solve the problems it is designed to solve, on time and on budget. A good design also makes for a program that is relatively bug-free and easy to maintain. It has been estimated that fully 90 percent of the cost of software is the combined cost of debugging and maintenance. To the extent that good design can reduce those costs, it can have a significant impact on the bottom-line cost of the project. The first question you need to ask when preparing to design any program is, "What is the problem I'm trying to solve?" Every program should have a clear, well-articulated goal, and you'll find that even the simplest programs in this book do so. The second question every good programmer asks is, "Can this be accomplished without resorting to writing custom software?" Reusing an old program, using pen and paper, or buying software off the shelf is often a better solution to a problem than writing something new. The programmer who can offer these alternatives will never suffer from lack of work; finding less-expensive solutions to today's problems will always generate new opportunities later. Assuming you understand the problem, and it requires writing a new program, you are ready to begin your design. This book makes the assumption that your computer has a mode in which you can write directly to the screen, without worrying about a graphical environment, such as the ones in Windows or on the Macintosh. Your compiler may have its own built-in text editor, or you may be using a commercial text editor or word processor that can produce text files. The important thing is that whatever you write your program in, it must save simple, plain-text files, with no word processing commands embedded in the text. Examples of safe editors include Windows Notepad, the DOS Edit command, Brief, Epsilon, EMACS, and vi. Many commercial word processors, such as WordPerfect, Word, and dozens of others, also offer a method for saving simple text files. The files you create with your editor are called source files, and for C++ they typically are named with the extension .CPP, .CP, or .C. In this book, we'll name all the source code files with the .CPP extension, but check your compiler for what it needs. NOTE: Most C++ compilers don't care what extension you give your source code, but if you don't specify otherwise, many will use .CPP by default. DO use a simple text editor to create your source code, or use the built-in editor that comes with your compiler. DON'T use a word processor that saves special formatting characters. If you do use a word processor, save the file as ASCII text. DO save your files with the .C, .CP, or .CPP extension. DO check your documentation for specifics about your compiler and linker to ensure that you know how to compile and link your programs. Although the source code in your file is somewhat cryptic, and anyone who doesn't know C++ will struggle to understand what it is for, it is still in what we call human-readable form. Your source code file is not a program, and it can't be executed, or run, as a program can. from the command line, where <filename> is the name of your source code file (for example, test.cpp). Other compilers may do things slightly differently. After your source code is compiled, an object file is produced. This file is often named with the extension .OBJ. This is still not an executable program, however. To turn this into an executable program, you must run your linker. C++ programs are typically created by linking together one or more OBJ files with one or more libraries. A library is a collection of linkable files that were supplied with your compiler, that you purchased separately, or that you created and compiled. All C++ compilers come with a library of useful functions (or procedures) and classes that you can include in your program. A function is a block of code that performs a service, such as adding two numbers or printing to the screen. A class is a collection of data and related functions; we'll be talking about classes a lot, starting on Day 5, "Functions." 1. Create a source code file, with a .CPP extension. 2. Compile the source code into a file with the .OBJ extension. 3. Link your OBJ file with any needed libraries to produce an executable program. If every program worked the first time you tried it, that would be the complete development cycle: Write the program, compile the source code, link the program, and run it. Unfortunately, almost every program, no matter how trivial, can and will have errors, or bugs, in the program. Some bugs will cause the compile to fail, some will cause the link to fail, and some will only show up when you run the program. Whatever type of bug you find, you must fix it, and that involves editing your source code, recompiling and relinking, and then rerunning the program. This cycle is represented in Figure 1.1, which diagrams the steps in the development cycle. Figure 1.1. The steps in the development of a C++ program. Traditional programming books begin by writing the words Hello World to the screen, or a variation on that statement. This time-honored tradition is carried on here. Type the first program directly into your editor, exactly as shown. Once you are certain it is correct, save the file, compile it, link it, and run it. It will print the words Hello World to your screen. Don't worry too much about how it works, this is really just to get you comfortable with the development cycle. Every aspect of this program will be covered over the next couple of days. Make certain you enter this exactly as shown. Pay careful attention to the punctuation. The << in line 5 is the redirection symbol, produced on most keyboards by holding the Shift key and pressing the comma key twice. Line 5 ends with a semicolon; don't leave this off! Also check to make sure you are following your compiler directions properly. Most compilers will link automatically, but check your documentation. If you get errors, look over your code carefully and determine how it is different from the above. If you see an error on line 1, such as cannot find file iostream.h, check your compiler documentation for directions on setting up your include path or environment variables. If you receive an error that there is no prototype for main, add the line int main(); just before line 3. You will need to add this line before the beginning of the main function in every program in this book. Most compilers don't require this, but a few do. directly to your screen. If so, congratulations! You've just entered, compiled, and run your first C++ program. 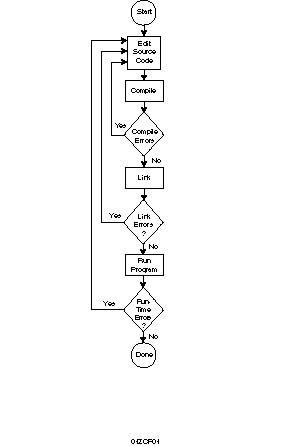 It may not look like much, but almost every professional C++ programmer started out with this exact program. Compile-time errors can occur for any number of reasons. Usually they are a result of a typo or other inadvertent minor error. Good compilers will not only tell you what you did wrong, they'll point you to the exact place in your code where you made the mistake. The great ones will even suggest a remedy! You can see this by intentionally putting an error into your program. If HELLO.CPP ran smoothly, edit it now and remove the closing brace on line 6. Your program will now look like Listing 1.2. Listing 1.2. Demonstration of compiler error. Hello.cpp, line 5: Compound statement missing terminating } in function main(). This error tells you the file and line number of the problem, and what the problem is (although I admit it is somewhat cryptic). Note that the error message points you to line 5. The compiler wasn't sure if you intended to put the closing brace before or after the cout statement on line 5. Sometimes the errors just get you to the general vicinity of the problem. If a compiler could perfectly identify every problem, it would fix the code itself. After reading this chapter, you should have a good understanding of how C++ evolved and what problems it was designed to solve. You should feel confident that learning C++ is the right choice for anyone interested in programming in the next decade. C++ provides the tools of object-oriented programming and the performance of a systems-level language, which makes C++ the development language of choice. Today you learned how to enter, compile, link, and run your first C++ program, and what the normal development cycle is. You also learned a little of what object-oriented programming is all about. You will return to these topics during the next three weeks. Q. What is the difference between a text editor and a word processor? A. A text editor produces files with plain text in them. There are no formatting commands or other special symbols required by a particular word processor. Text files do not have automatic word wrap, bold print, italics, and so forth. Q. If my compiler has a built-in editor, must I use it? A. Almost all compilers will compile code produced by any text editor. The advantages of using the built-in text editor, however, might include the ability to quickly move back and forth between the edit and compile steps of the development cycle. Sophisticated compilers include a fully integrated development environment, allowing the programmer to access help files, edit, and compile the code in place, and to resolve compile and link errors without ever leaving the environment. Q. Can I ignore warning messages from my compiler? A. Many books hedge on this one, but I'll stake myself to this position: No! Get into the habit, from day one, of treating warning messages as errors. C++ uses the compiler to warn you when you are doing something you may not intend. Heed those warnings, and do what is required to make them go away. Q. What is compile time? A. Compile time is the time when you run your compiler, as opposed to link time (when you run the linker) or run-time (when running the program). This is just programmer shorthand to identify the three times when errors usually surface. 4. What are the steps in the normal development cycle? 1. Look at the following program and try to guess what it does without running it. 2. Type in the program from Exercise 1, and then compile and link it. What does it do? Does it do what you guessed? 3. Type in the following program and compile it. What error do you receive? 4. Fix the error in the program in Exercise 3, and recompile, link, and run it. What does it do?